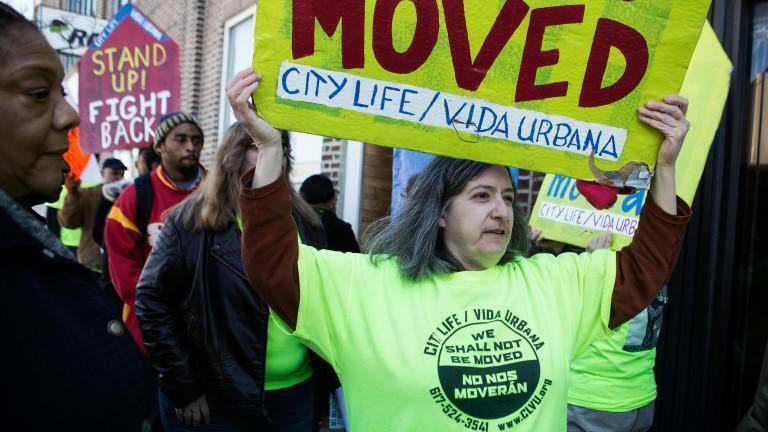 Housing advocate Irene Glassman participates in a demonstration protesting no-fault evictions, in front of the offices of Advanced Property Management, in the Hyde Park neighborhood, on March 12. When I lived in East Boston in the late 1970s, the president of a local credit union offered to sell me a foreclosed triple-decker on Lexington Street for $500 down. He explained that even with such short money down, the rent from two apartments would subsidize the mortgage payments, and I could probably live in the third unit rent-free. The only stickler, he added too casually, was that I would need to evict the current tenants, families on welfare who were in arrears on the rent. I was 24 years old and couldn’t picture myself as a landlord. Mostly, though, evicting poor families from their homes was such bad karma that I wouldn’t even consider it. In those days, East Boston was a mostly white, working-class neighborhood struggling like many communities from widespread disinvestment in American cities, but it was stable. Gentrification was almost unheard of. Properties rarely flipped. Today, the volatile mix of a white-hot real estate market and a community of recent immigrants unaware of their rights has made my old neighborhood ground zero for an epidemic of evictions and displacement. Desmond, a Harvard sociologist and MacArthur “genius” grant recipient, says eviction has become “a critical and common event” in poor American communities, and his research is not just anecdotal. Over the last two decades, median rents in the United States have increased by 75 percent, while incomes have remained mostly flat. One in five renters now spends more than 50 percent of their income on housing, when the standard is 30 percent. Rent subsidies and other housing assistance only reach a fraction of those who are eligible. One solution Desmond recommends is a universal housing voucher to ensure that no tenant pays more than 30 percent of income on rent. But housing advocates in Boston are pushing a far more modest “just-cause eviction” ordinance for rental properties of four units or more. The ordinance has been watered down so that it now mostly just requires landlords to notify the city of evictions, so that tenants can be told their rights. As Desmond and others have found, the majority of evictions never end up in housing court or on a city’s record books. Most are brutally fast, whole families gone within 30 days. No one knows what happens to them — except a few worried neighbors and the homeless shelters searching for more beds.